We love a good bottle of fine wine, but the habit gets expensive quickly. Despite evidence in the popular press that Americans are spending more on wine (a trend led, surprisingly for some, by Millennials), we rather strongly believe that great wine can be had a great prices, which is why we typically stock a "house wine" on our shelves. This is a great idea because it allows you to spend a bit less on wine by serving something that is better than its price, use some discretion when serving guests who aren't as picky (or whose tastes not as sophisticated), and avoid blowing an expensive high end wine for that "last bottle" when friends are over. When choosing a house wine, use our two main criteria that it (1) be broadly pleasing, i.e. swill is automatically disqualified, and (2) outperform its price point. They also must cost no more than $15 per bottle when purchased by the case, and in most cases we're looking at house wines in the $8 - $12 range. We typically choose a new house wine by trying a lineup of different options, and then purchasing the winner by the case until we tire of it or until it becomes (at least temporarily) unavailable. We tend to stock a house red in the colder months (we find less of a need for a house white), and both a house red and white in the warmer months. It's important to not get stuck on a single wine, lest you grow numb to all it has to offer. Today we bring you the first installment of "House (Wine) Hunters", with thanks for the idea to a good friend, who as First Mate and Chef on yachts in the Caribbean is always in search of a wide range of fine and casual wines with which to wow charter guests. "Bodega" is Spanish for "winery", so you'll see this in a lot of Spanish wine naming schemes. This bottle from the "LAN" winery in Spain's premier Rioja winemaking region is labeled a "Crianza", meaning that it has been aged for at least two years, of which at least six months have been in oak barrels. It's a safe bet that red wine from Rioja will be a 100% varietal made exclusively from the Tempranillo grape, and this bottle is no exception. It's initially unclear what you're sniffing in the rather alcoholic nose, but we found a really pleasant mouthfeel of rustic, gentle tannins and chalky cranberry in the palate. It goes down smoothly, but leaves a little tannin on the front to middle of your tongue. This makes a particularly great house wine because it's drinkable on its own, but is hearty enough to be very versatile with food. 2011 was a great winemaking year in Spain, and this LAN was far and away our winner for this episode of House (Wine) Hunters! The Enira comes from Bulgaria's Bessa Valley region, and was our second choice in this lineup. Our initial thought was that this wine does not offer up a particularly beautiful color, instead showing more of a subtle orange hue. The nose was fine, but unremarkable with a touch of new car smell (not always a bad thing) and a little vegetation. The palate offered us some stone fruit, cherry juice, an ever so slight touch of caramel and that barrel taste you might associate with a Port wine or a bourbon. We liked it, but couldn't pin down exactly why other than to say that it's inoffensive so can probably be enjoyed by most of your guests, is versatile with food, but could also be drank on its own. The Enira would have competed for top spot in other house wine lineups, but the LAN bested it by a mile. Returning to Spain, this time to the Campo de Borja region for our third contender. Situated in Aragon in northwestern Spain, Campo de Borja produces higher acid wines that therefor do very well with food. 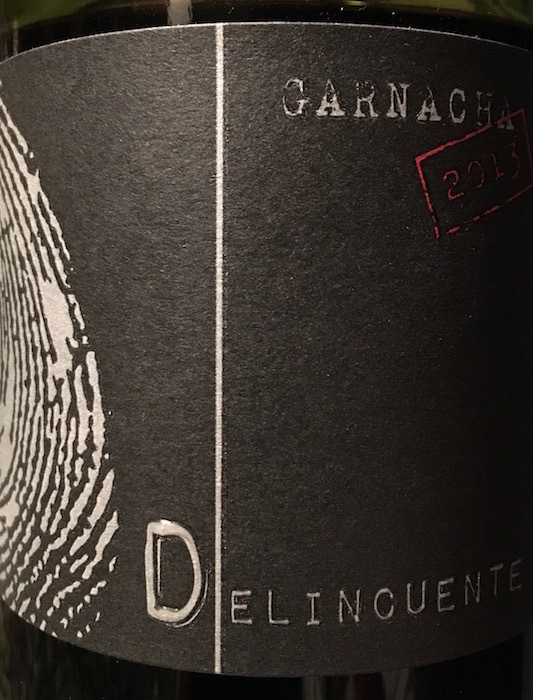 Most American drinkers who recognize the region have probably been exposed to it through 100% Garnacha (known as "Grenache" outside of Spain), often lower cost table wines that are a step below Crianza on the aging scale. Unfortunately, the issue with the Delincuente is that it isn't as good as some of its competition from the same region. It underperforms on both price and quality, failing to taste out much above its price point with a warm, alcoholic, rusty metal nose that gives way to a slight amount of fruit and burning wood as it is exposed to air after opening. The palate is definitely characteristic of a Campo de Borja, but beyond some tribute to dark fruit there is nothing complex enough to divine anything in particular.